Brisbane, Australia Elliottsofficially announced their partnership with Saint-Gobain Performance Plastics for the exclusive distribution of Saint-Gobain?s line of ONESuit chemical protective suits throughout Australia and New Zealand. 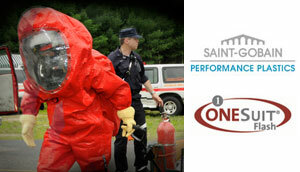 As part of the Protective Systems group of Saint-Gobain Performance Plastics, the ONESuit line of chemical protective suits draws on an extensive history in materials technology and chemical/biological (CBRN) protection to develop products that are engineered for safety and increased mobility. "The ONESuit brand has become well-known by first responders throughout the world for its level of protection and user comfort," says Anthony Elliott. "We have already experienced a tremendous amount of interest in these suits and look forward to fulfilling demands of first responders who are looking for increased mobility and uncompromised protection, while tackling dangerous chemical and biological threats." Peter Kirk, Market Manager, Saint-Gobain Performance Plastics said Elliotts were the logical partner for the ONESuit line in Australia and New Zealand. "Partnering with Elliotts was a natural choice for us," said Kirk. "They have decades of experience with meeting the needs of emergency responders who are looking for only top quality products and attentive service." Each ONESuit garment features a single-skin design, engineered using Saint-Gobain?s proprietary high-performance Coretech Barrier Membrane and Challenge material technology to ensure flexibility and enhanced user-comfort. The suits are certified to various EN and NFPA standards, ensuring international standards of protection. Elliotts is an Australian based manufacturer and distributor of world-class quality safety gear servicing the Australasian market. Elliotts take care to only supply quality protective clothing and equipment that protect people from harm on a daily basis. Products include protective clothing for fire fighters, hazmat, chemical splash, the metals industry, wet and cold weather and ArcFlash. Products also include personal protective equipment from Pyramex and PureSport Hydration products. For more information visit www.elliottaustralia.com or contact Anthony Elliott (07) 3265 2944.